Perfectionism and work stress always go hand-and-hand. Perfection can be a standard to shoot for, but becomes unhealthy when it is the only standard accepted. Some people take the goal of perfection too far…and there is a price to pay. True perfectionists are never satisfied. Chronic or daily attempts to achieve perfection are driven by feelings of inferiority and self-hatred (though the perfectionist would call it "pride" or work ethic). This not only impacts the person and their health, it seriously damages the morale of their co-workers. 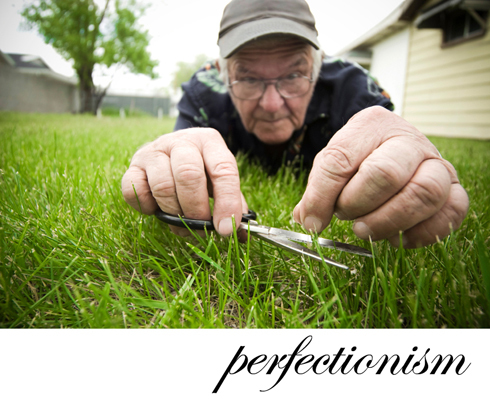 Perfectionism has not received enough attention in the workplace, in my opinion. It can be one of the most destructive traits to both the individual and to others’ motivation and worker self-esteem. It is the leading cause of procrastination, which is ironic, as the tendency to procrastinate creates even more self-loathing and the cycle continues. I have seen few personality traits as problematic as the insistence on perfection. • Do you find yourself becoming frustrated because you feel that you aren’t as far along as others? • Do you feel others (even loved ones) are always assessing you? From your clothing choice to your word choice…that you are regularly being scrutinized by the people in your life? • Do you criticize yourself even when you are learning something new? • Do you expect yourself to do everything well at all times? • Do you find yourself taking part in activities in which you have little interest to gain approval? • Have you been told by the people around you that you focus on the problems in life and, even if everything is okay, you find something that bothers you? • With most tasks, do you feel that there is a “right” way and a “wrong” way to do them and you are uncomfortable with alternative ways of getting them done? If you answered “yes” to more than a couple of these, then I would start to work on your need for perfection. Perfection can be achieved…it just can’t be the standard for everyday performance. I can honestly think of fewer reasons for work stress---and ultimately hating your job---then demanding perfection from others or having it demanded upon you on a daily basis. When you set perfection as the standard for all of your objectives, you are being unnecessarily harsh on yourself. You deny yourself the reality that you can only become better when you are allowed to try new things, take risks, and make mistakes. The necessity of self-acceptance becomes impossible and this lack of acceptance is used as a barometer for others’ performance as well. If you are deeply ingrained in the perfectionist mindset, then this information is probably being discounted by you as you read this. I urge you to just notice the possibility that you may be causing yourself unnecessary wear and tear by striving to achieve a standard that no one but you insists on. • Remember that you have a distinct and unique contribution. Stop comparing yourself to others. • Develop your own style and preferences instead of following another person’s way. • Stop analyzing every interaction/conversation you have with important others. • Accept the fact that sometimes you will make poor decisions and that you will learn from them. Research shows that people who take risks and create new and exciting progress will make, on average, two big mistakes a year. Those who stay in their comfort zone and never try anything new? They will make two big mistakes a year. Why not achieve and stretch and get excited about something instead of staying in the rut of autopilot, albeit perfectly handled? Remember: perfection is not possible for humans! I have 100 more ideas just like this in my newest book "101 Ways to Love Your Job," Click on the link below to preview more entries on Amazon.com (or get it at your local bookstore).